Woman And Home Competitions | Prize Draw - Win Lumie Bodyclock! Wake up to light! Light therapy specialist Lumie has 4 lights to give away! Lumie Bodyclock simulates a gentle sunrise to wake you naturally. At bedtime, drift off to sleep with a gradual sunset. Original Lumie Bodyclock is a medical device that is shown to improve your quality of sleep and make you feel more energetic and alert. Wake up to a life made bright! 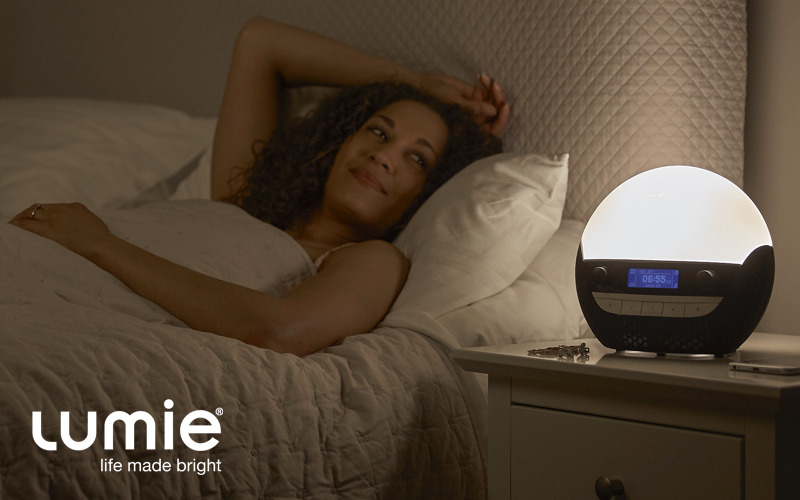 First prize is their brand-new wake-uplight Lumie Bodyclock Luxe 750D worth £199. It provides a complete light and sound experience for easier sleep and brighter waking. It features low-blue light to be non-alerting at bedtime and high quality audio with DAB radio, Bluetooth connectivity and a selection of over 20 sleep/wake sounds. Second prize is Lumie Bodyclock Iris worth £160. It offers a touch of luxury for ladies by combining aromatherapy with light therapy for the first time. Comes with twin chambers so you can easily switch between morning and evening essential oils. Third prize is Lumie Bodyclock Active worth £99.95. It simulates a gentle sunrise to wake you naturally while at bedtime a gradual sunset will help you drift off to sleep. Using light in this way is shown to improve your quality of sleep and make you feel more energetic and alert. This model comes with FM radio and options to personalise your sunrise and sunset. Fourth prize is Lumie Bodyclock Starter worth £59.95. The perfect introduction to light therapy, it offers a 30 minute sunrise and sunset with optional beep. The prize: Win a Lumie Light!